Many more of us are starting to use Jylpah's code to extract significant statistics about their games. I think that instead of putting them here and there it would be nice to put them in the same place and update them so they are accessible to all. Here is what I have started on my alt account. My WR over these battles is ridiculously high. My carreer wr is 61%. Things tend to even out. Main account with 18 000 battles, consecutive battles. Career WR is 57%. I have switched supremacy mostly off. Edited by gallabru, 12 February 2019 - 10:03 PM. The guys who built the replay db on wotinspector.com, that the scripts use are hoping to eventually add some functionality to it, to analyse the data. The biggest issue currently is it doesn’t store the team composition data in the replay that has ro be requested from WG API, so unless you store that yourself you get the player stats as they are now not what they were when the battle was done. I would gladly have the current stats of all players of each game for a start. I have seen that I can get the time of the battle too. 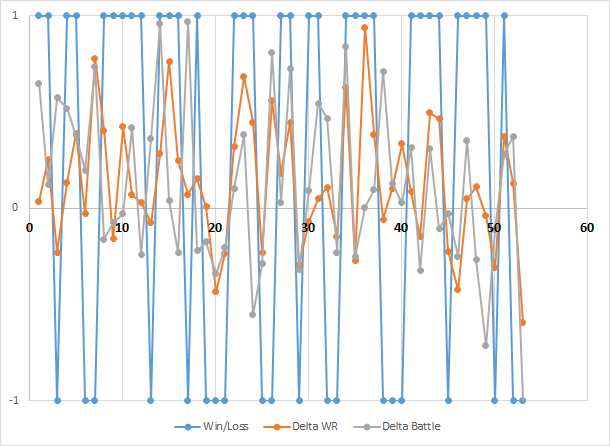 Then it would be easy to monitor the correlations between losing and winning streaks with team composition for instance (largest wr, wr difference, wr span, change from one battle to the next, battle counts...). I have started some analysis with more battles. The idea is to see if there is some relation between the battles won and some characteristics of the team compositions. I have tried difference in battle counts, difference in WR, top tier. The number of battles does not seem to play a large role ("Aux âmes bien nées, La valeur n'attend point le nombre des années", Le Cid - Corneille). Edited by gallabru, 12 February 2019 - 01:00 PM. Edited by gallabru, 31 January 2019 - 12:19 PM. Battles added on the low battle count account. Playing late made me see high battle count players. Still, I mostly see players with less than 5k battles. I would need to be able to track each game individually to see how this goes in terms of streaks and exact team composition since these are only averages. For instance, at present, in the second table, I am not able to see if I am losing more when both enemies WR and battle counts are unfavourable or if only one is enough. Per tier stats would be nice too. For instance, the average battle count of the players I saw was below 3k at tiers 5, 6, 8, below 4.1k at tier 7 and above 7.2k at tier 9 (but only 37 battles). And being still mostly stock on my AMX 50 120, my losses correlate with tier and battle counts. So there is definitely some more analysis to do. At the moment, this will require 100 more battles to have something like 100 wins and 100 losses at least. And also 100 battles below tier 9 which seems to bias the results. Edited by gallabru, 04 February 2019 - 11:10 AM. Mjr_Eazy sent me a modified version of Jylpah's scripts. I can now track each battle. I did some analysis on my main account over 53 battles. My WR is 57.6, 18000 battles. I have also plotted the evolution of battle win (+1) / loss (-1) as a function of the battles and added the WR difference and relative battle differences to see if there are obvious correlations. The WR difference was multiplied by 5 so the variations could be seen. My stats are included in the averages of the teams. There are some winning/losing streaks where there seems to be a correlation with teams composition, but some others where there seems to be anti-correlations. I will try to build some estimator of the correlations. Any suggestion welcome. Edited by gallabru, 05 February 2019 - 06:35 PM. Similarly, on my alt account (2800 battles, career WR=61.6%). The overall stats are in OP. I have carried some battle per battle analysis over 126 consecutive battles, my WR being 65.9% for this series. First, what is the WR distribution of both teams ? I have plotted the outcome of the battles (win=1, loss=-1) together with the difference in average WR of both teams (multiplied by 10, the maximum difference being below 10%). The variations of WR differences look random. The correlation with battle outcome is not obvious but 68% of my wins are associated with a favorable WR difference (i.e. the average WR of my team mates is larger than the average WR of the red team). On the influence of other parameters on wins, 65% of my battles are won when being top tier, 50% when my team has a larger battle count. Second, the big question of battle counts. Plotted below the number of players with more than 5k battles in each team as a function of the battle. To summarize, 61% of battles are made with teams composed of ‘newbies’ only. Edited by gallabru, 20 February 2019 - 01:58 PM. 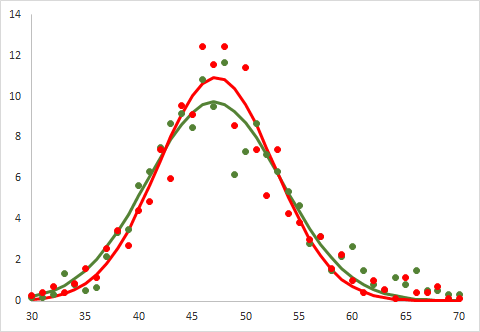 Amongst stats that are nor related to me, here are the WR distributions of my teams and red teams on my alt account. My WR was not included otherwise there would be a peak of 126 at 61. Both were fitted to a Gaussian. Both are finally centered in 47%. FWHM are 6.4% for my teams and 5.3% for green team, but again, my there are less data for my teams. The Gaussian is centered in 47% and the width is 5.8%. Edited by gallabru, 20 February 2019 - 01:56 PM. Little game (I could do a poll). 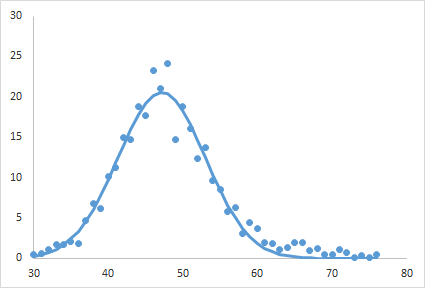 I have generated teams with a random WR distributions according to what I have observed (see post above). I have taken 2 times 882 random numbers from random.org to generate two series of 126 teams of 7 players. 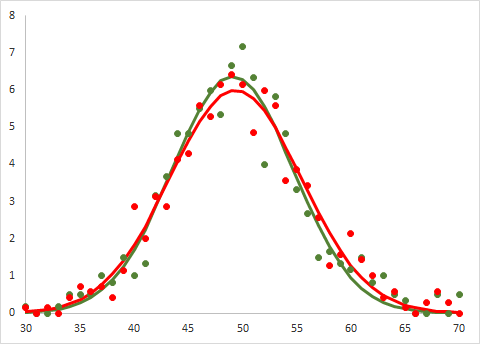 Then I have calculated the WR differences between the average WR of the 'green' and 'red' teams. I have plotted this together with my actual games. 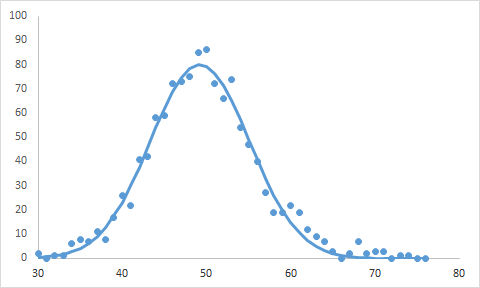 Now, here is the game : which curve is the generated one, which one is mine ? Edited by gallabru, 11 February 2019 - 11:49 AM. Obviously a real study of the WR differences would require some statistical analysis. Jylpah sent me to the Khi-squared wiki. Understanding this will require more effort that getting 60% wr on my main account. But I will ty to give it a go. Same thing on my main account, 93 battles recorded. The first thing that looks significant is that the average WR of the players is slightly higher, i.e. 49.2% with 95% of the players at +/- 5.8%. I have had a nice losing streak (47.5% WR over last 40 battles). It correlates with the WR difference (x10 factor here) and average battles of the teams. 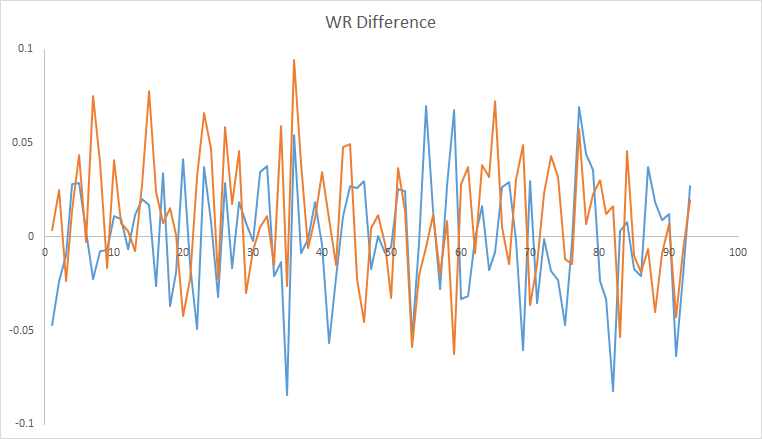 Still, the evolution of the WR difference when plotted against a purely statistical distribution is not obviously rigged. Edited by gallabru, 20 February 2019 - 01:54 PM. My temporary conclusions are that it is difficult to see any obvious deviations from something purely random so far. There is need from more in-depth analysis. Maybe something multi-factor ? My hope is to find something, otherwise it would be boring. It is weird that the average WR in the sandbox (47%) is lower than outside (49%). If these populations were isolated these values should be the same. Either the small occurence of more experienced players in the sandbox is enough to bias the statistics, or because of the absence of supremacy at lower tiers, that presumably sandbox players see more, induces more draws ? Or more experienced players tend to try harder to force a result resulting in less draws ? Note : there seems to be a correlation between botton/top tier and negative/positive average WR and number of battles (multifactor). Note 2 : checked -> the average WR of the players increases with battle count. Edited by gallabru, 14 February 2019 - 12:21 PM. To check how WR difference in teams correlates along time (are streaks manipulated ? 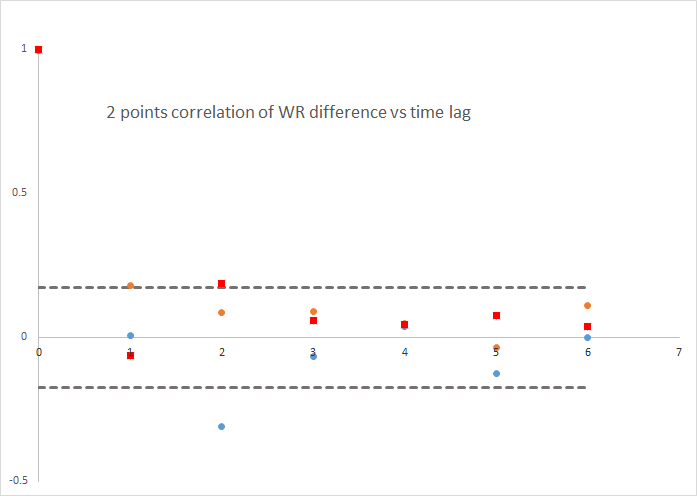 ), I have computed the 2 points auto-correlation function of the difference in WR averages of the teams (see above) as a function of battle lag. It says how much we can predict the WR difference of the teams after a given battle lag if we know what it was at some point. Purely random should yield 1 at a time lag of 0, and 0 for other time lags. The 95% confidence is given by the size of the sample. Blue dots from the random generated data, orange dots on my alt account, red main account. Gray dotted lines, 95% confidence for 126 battles. Edited by gallabru, 13 February 2019 - 01:17 PM. I must admit I play games, including this one, to give my grey matter a rest after it’s been mushed at work. I’m totally impressed with the commitment and investigative work some people are prepared to put up in order to advance their skills. I must admit you have a point here, lol. Although it has nothing to do with advancing skills (or mathematical ?) but more about being convinced that random is unfair sometimes. On a more general viewpoint, this is not more stupid than learning 100th of chess games or ancient greek, collecting stamps, lifting weights, supporting Everton FC... which all are admitted ways of letting its grey matter melt. Edited by gallabru, 14 February 2019 - 12:31 PM. Your work is really impressive, gallabru. Respekt!